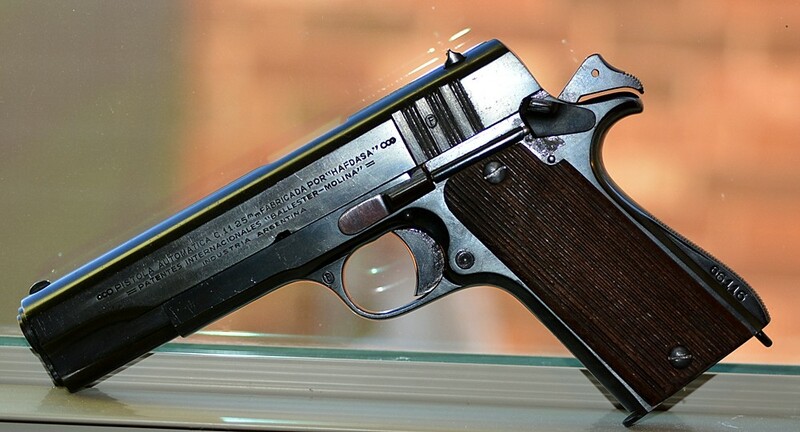 I found this all matching Argentine Ballester-Molina .45 ACP at a local gun shop. I bought it because it is one of the cleanest Ballesters that I've ever seen. 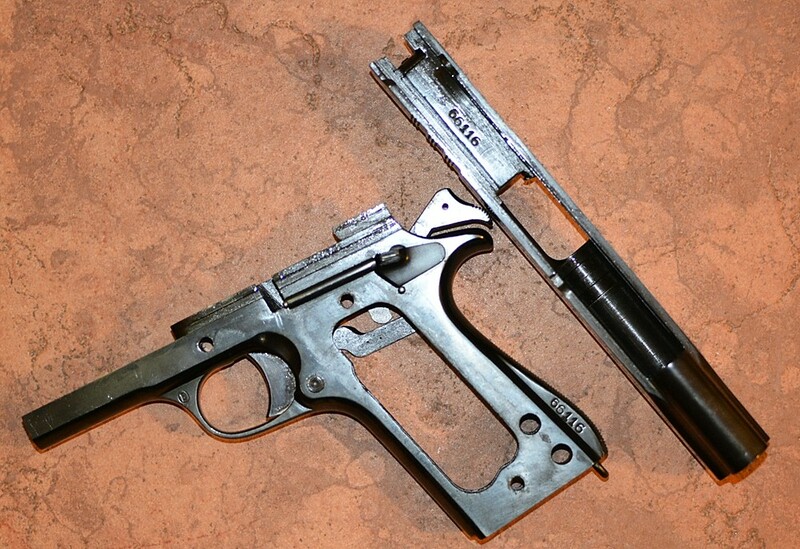 It is all matching; the serial number is different the the other number on the gun; both numbers are on the gun and two matching magazines where they are supposed to be. I'll be in Argentina at the end of the month and I will visit the Museum of Arms of the Nation (Museo de Armas de la Nacion) in Buenos Aires to see if they can help me with any info. A good cheep 45 for a truck gun. Sears and mag lips are worn out and may need replacements. That example is way to nice for a shooter. As good as its gets. Pick up a holster for that jewel. That is a real nice concise article on Molinas. Very Nice.. My only complaint would be that G Gordon Liddy told me that they were made out of Graf Spee salvaged metal.. And I would not want to be the one to tell him he's wrong. Personally when I clean mine I can almost make out the letters "Gra. S.." inside on the fame.. Thanks all for the compliments on the pistol's condition. I had not heard the GRAF SPEE connection I can 't wait to spring on someone!!! modern efforts to salvage the ship.. If that ever happens it will be easier to see if there were any real salvage in the 1940s. But she sat in the mud for years before sinking and there was some cool stuff taken off her.. The Graf Spee thing has pretty much been debunked by the experts. Sources in Argentina cite that Sweden supplied most of the steel. I think the Graf Spee story is appealing and will live on for a long time but there's just no evidence of donor steel from the Graf Spee being used in Ballesters. 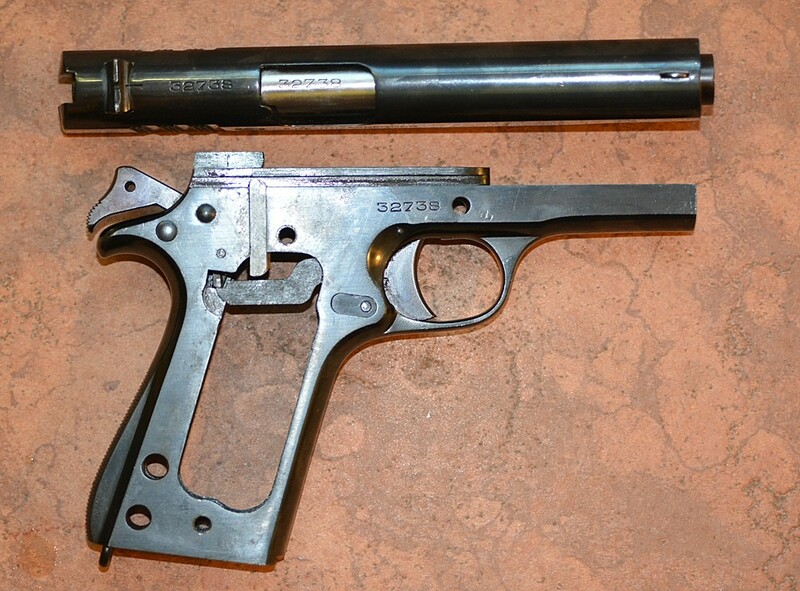 I went from being a skeptic in 1967 of the Ballester-Rigaud and Ballester-Molina pistols to a full-fledged fan. I've owned a dozen or so over the years (still got two) and I can say with absolute certainty that they are the equal of any WW2 1911A1. Just as accurate, just as durable, and just as reliable. 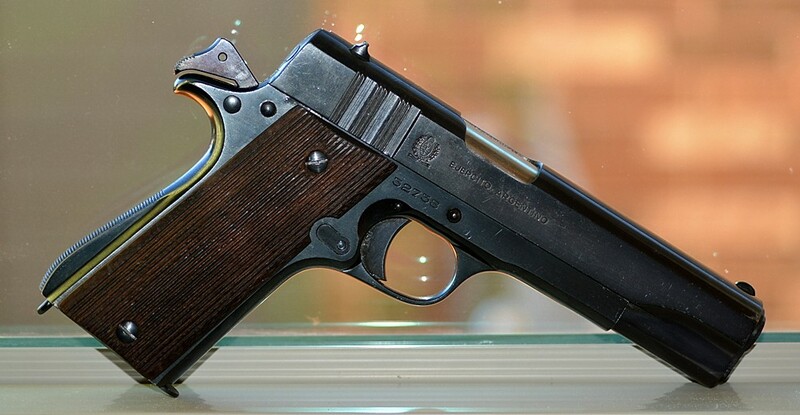 In one aspect at least it is superior to the 1911. By this I mean that the longer tang on the back of the grip ensures that there is NO hammer bite whatsoever. I suffer from hammer bite with 1911's using a spur hammer so all my commercial 1911's sport rowel hammers. I'm not gonna change out hammers on a vintage WW1 or WW2 1911 so if I shoot any of them I wear a glove. The two biggest weak areas in Ballesters are their miniscule sights and the poor quality original magazines. One of my Ballesters has had modern MMC sights installed so it's the one I shoot most often. Arky-Boy just re-registered recently. He and I put together a fairly comprehensive list of slide markings, but there might be some we missed, and there may be an error or two. Just the best we could do without actually traveling to Argentina. I hope he sees this post; he has a lot of good info. Thank ArkyBoy. He did the lion's share of the work. A few years ago before I retired, I worked with this 5 ft, 1 inch tall petite lady shooter who had become tired of shooting 9mm pistols. She wanted to add a .45 acp pistol to her small collection and asked me if I had anything I could sell her. She was on a pretty tight budget so I offered up one of my Ballester-Molina pistols for $300 and she jumped on it. My wife and I went to the range with her the first time she shot it and you would have thought she had been shooting one all her life. Her first 7-shot group was 3.5 inches and she only got better as the day went on. Just incredible. Unfortunately, she is a bad girl who has taken to referring to the pistol as a "Ballerina Molester" and I have been unsuccessful in correcting her. Can't push too hard. I might get shot, I dunno.